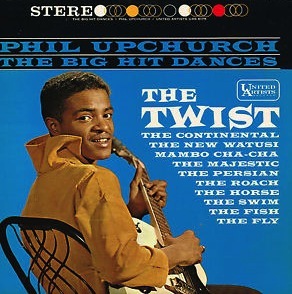 It was on a superb compilation devoted to the late-night club scene in 1960s London, ‘From Route 66 to the Flamingo’, that this writer first heard Phil Upchurch and Combo’s stunning ‘You can’t sit down’ and here it is showcased in its full two-part versions and serves as the centrepiece for a fascinating trip back down memory lane to the R & B meets jazz influenced 45s that captured the jukeboxes and hippest night club of the late 1950s and early-mid 1960s with new dance crazes of the time the unifying theme. If the tasty guitar licks of the Upchurch combo took your fancy first time round, then there is plenty of other music to capture the heart and soul and Upchurch himself is leader on no less than nine numbers. Indeed another highlight is the guitar and brass led organ groove of ‘Here it ’tis – the roach’ which comes across as a classic Blue Note tune of the era. King Curtis and the Noble Knights turn up on a piano dominated number with honking saxophone on ‘Soul Twist’. A gem of a track and fitting nicely into the They most certainly do not make them like this anymore’ category is ‘The Madison Time Pt. 1’ by the Ray Bryant Combo which features a lengthy monologue with a modal Miles Davis brass background and a terrific tenor saxophone solo. The original author’s version of ‘Land of 1000 Dances’ by Chris Keener and late made into a hit by Wilson Pickett is not as gritty as the Wicked Mr. Pickett version, but worth the admission price all the same. Some New Orleans funk enters the equation on Ernie K-Doe’s ‘Popeye Joe’ and there is truly hypnotic riff by Nat Kendrick and the Swans on ‘(Do the) Mashed Potato (Pt. 1)’. For one of the precursors of a major dance craze, look no further than Hank Ballard and the Midnighters epic ‘The Twist’. Blue Note would take a leaf out of these 45s and issue a whole series of organ combo and soul-jazz singles by the likes of Lou Donaldson, Horace Silver and Jimmy Smith among a host of others deliberately aimed at the urban African-American audience who liked listening to the latest sounds while grooving the night away. It was a marketing ploy that delivered handsomely and the music on this compilation could just as easily comprise an evening’s entertainment in one of these now defunct clubs.